I would visit the 'ship' painting in St. Vartun's Chapel in the Church of the Holy Sepulchre. This chapel is usually locked but I've heard that the Armenian owner of a nearby souvenir shop has the key. That would be a special treat! Very few people are lucky enough to be allowed in to see the famed ship painting. The Chapel of St. Vartan is an Armenian chapel on the north side of the Chapel of St. Helens. It was discovered in the 1970s and includes walls from the second century, thought to have been built by Hadrian. 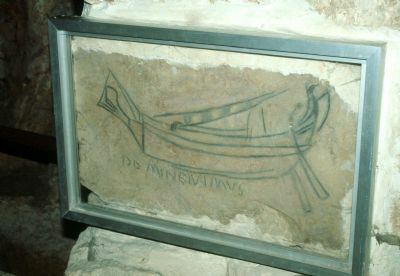 One of the stones is etched with a merchant ship and an inscription that could mean either “L-rd we shall go” or “gift of Marcus Nominus,” and dates from around 330 CE. If anyone has actually seen it, please let us know what you thought! Unfortunately, we know very little about the ancient world. This ancient ship painting is a real treasure. This is an evidence of the ancient world existence. Thanks for sharing and i like to read posts on this blog. Amazon is the world's largest online store and amazon provide Free gift card codes for amazon from which we can add funds to our amazon account. Get the latest way to facebook hack because this is the only way to get the amazing fb account hacker. This is the ancient Philistine ship. Philistines was known as Sea Peoples. This ship was the sailing ship. It will be like trespassing and there will be serious punishments according to the sources. But one can try the other way of entering into that church through its back gate. I happened to see this painting and it was really splendid. We can't imagine how it was painted in those days. This ancient ship is beautiful than the modern ship. You are lucky that you have seen this pain in your won eyes. I have heard many things about this place. But I am seeing the image first time. I have many questions about this mysterious and centuries old place. Anyways thanks for information about Jerusalem, Its great. The essay service Australia is helping students world wide in many different courses. Return to Your Favorite One-Day Jerusalem Tours.